What are angels? What are they entrusted to do? What stories do we meet them most frequently in? Are they always beautiful? Are they always good? 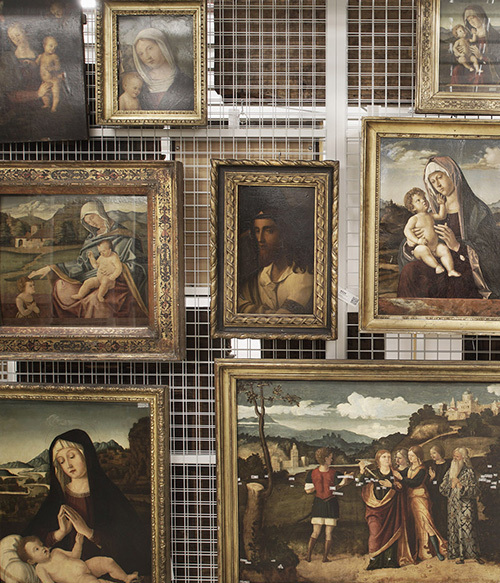 Our ’angel tour’ takes visitors on a journey through angelic mysteries using fifteen works in the museum’s collections of Old Master Paintings. Angels, like humans, have personalities, emotions, free will and awareness. They can speak, cry and wail, but they have a few advantages compared to us, humans: they can fly, live forever and are indestructible. They are the easiest to identify by the wings on their backs. If they have four wings, they are cherubim, if they have six, they are seraphim. Sometimes they have halos painted for them, but it is not mandatory. 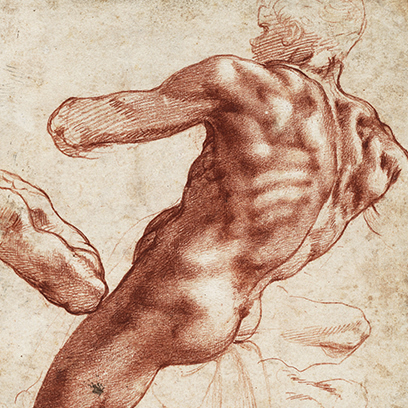 They have no gender but when featured in works of art, it is easy to decide if they are more masculine or feminine. They can have long and short hair, curly or straight. Their clothes are typically white but – apart from black – they can be seen dressed in virtually any colour. Angels pictured without clothes and resembling chubby little children are called putti. Angels have spiritual bodies but in the earthly sphere they can appear in human form, thus they are at home both in the heavens and on earth. They are representatives or messengers mediating between God and people. Their name (in Greek: angelos) actually means ’messenger’. One of the most famous dialogues between an angel and a human can be found in the Gospel of Luke, where Archangel Gabriel breaks the news to Mary that she would give birth to a boy conceived from the Holy Ghost and that she would name him Jesus. The angel also delivers news to Mary about her relative, Elisabeth, who, despite her advanced age, is also pregnant. Luke uses two important details to underline that what happens is not a mere apparition but the angel is actually present and communicates: Gabriel enters the room and speaks. 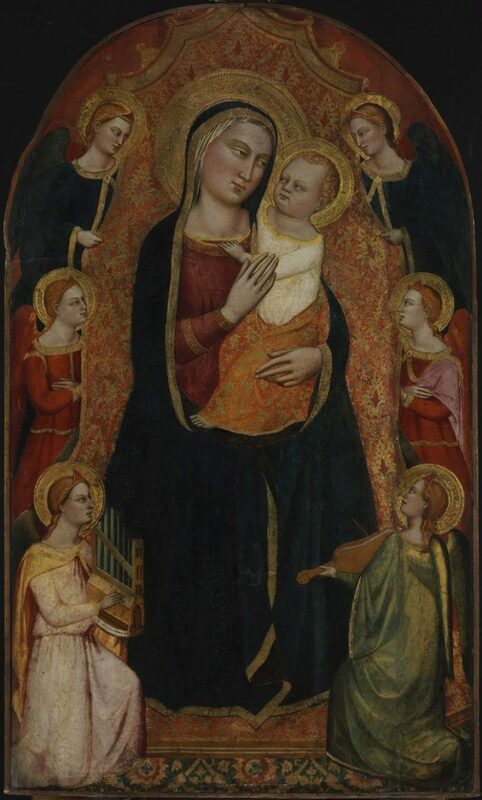 In medieval painting the words of angels were often indicated with so-called banderoles and movement was represented by dynamic lines of draperies, just like in this remarkable small portable altarpiece. If we call someone ’an angel’ we attach positive traits – and above all goodness – to that person. It is true that the majority of angels are good but there are fallen, evil angels too: they are referred to as devils and demons. And do not forget about the greatest rebel: Lucifer (Lux fero – bringer of light), who himself had been an angel but after inciting one third of the angels to revolt against god, as written in the Bible, he became infamously known by the name of Satan. Christ was crucified along with two thieves, i.e. criminals. One (traditionally on Christ’s right) repented his sins before dying so he entered the Kingdom of God, while the other one mocked him and therefore ended up in Hell. In Buonaccorso’s painting two angels can be seen above the cross of the Good Thief, while two black, bearded devils, each holding a pitchforks, are depicted above that of the other one. Do they always have wings? Although angels are typically depicted with wings, there are depictions of angels without wings too. One such example, preserved in the collection of the Museum of Fine Arts Budapest, is a picture by the Netherlandish painter Gerard David, in which the two figures clad in white garments and kneeling before Christ are not two praying Lilliputians but wingless angels. So sometimes it is hard to identify them. If angels cannot be obviously identified in a picture, we need to look for certain themes. But what are they? 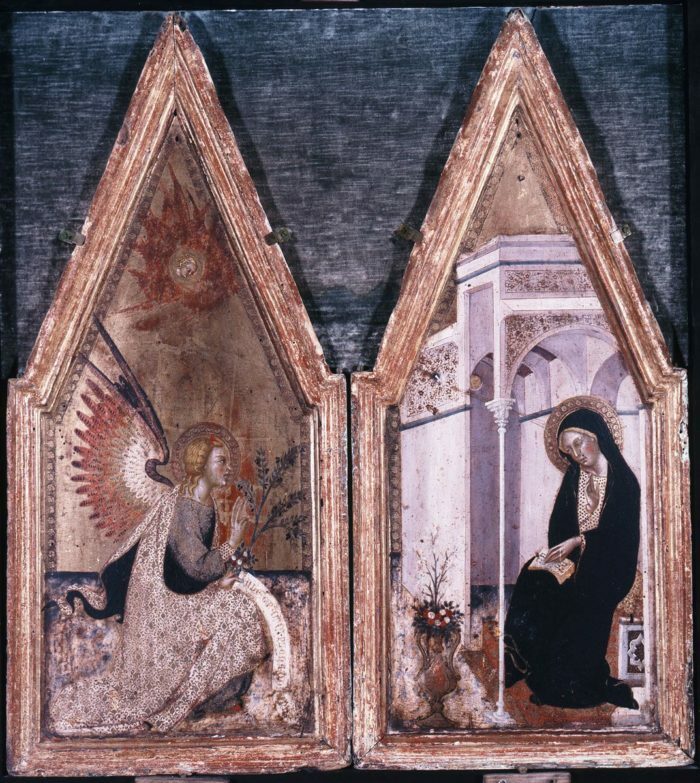 The best starting point is to look for New Testament stories, and within these certain episodes in which angels are guaranteed to play a part, for example the Annunciation, the Birth of Christ, and the Crucifixion. If you are in search of an archangel, find depictions of Judgement Day, when Saint Michael is weighing the souls, or where he is shown fighting. Of the Old Testament scenes where angels are typically present we recommend the Fall, the story of Abraham and Isaac, Jacob wrestling with the angel, and Hagar fleeing into the desert. Angels are equally at home on the earthly and heavenly spheres, so do not be surprised if you see them in mid-air in some pictures. 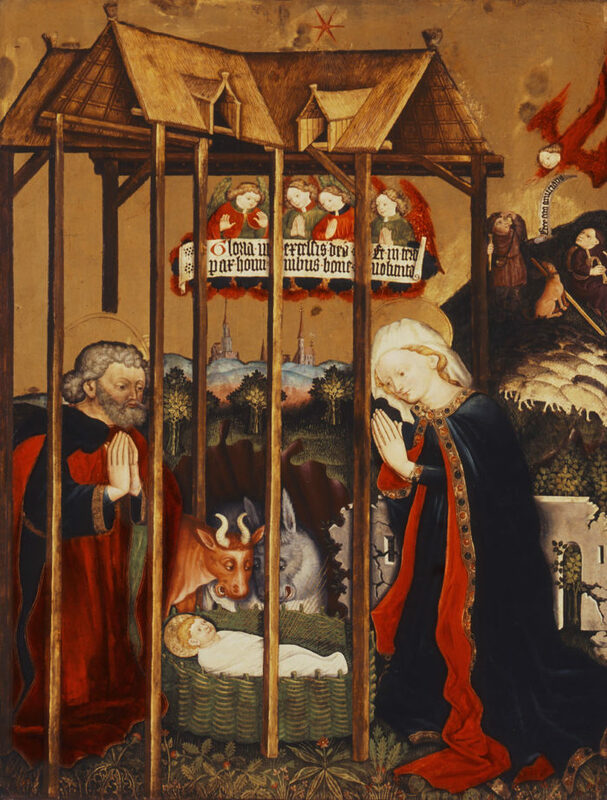 In Brixen’s painting, for example, they are hovering above the stable where Christ was born, holding a text in Latin (“Glory to God in the highest; and on earth peace to men of good will”). The angels in red have green wings and vice versa. One angel is depicted praying with his arms extended, and two others with their hands clutched. Our personal favourite is the third one, whose right hand rests on his chest, while holding the inscription with his left hand. There is yet another angel in this picture: the one in the top right corner, clad all in red and depicted ’at work’ as he is descending from the sky like a test pilot, taking the news of the birth of the Saviour to the shepherds. 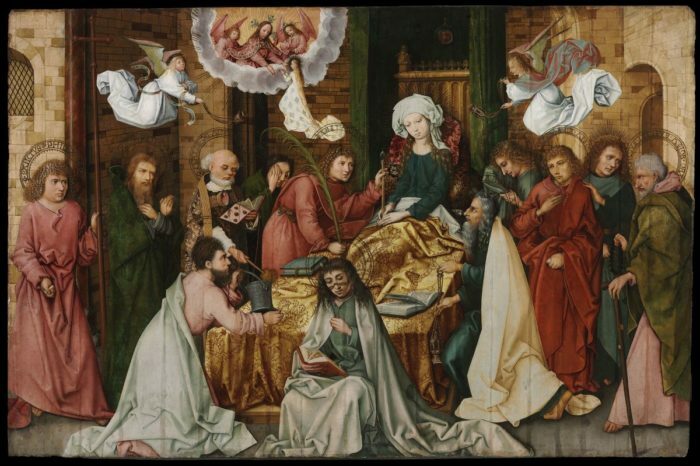 Although Mary seems to be happily sitting on her throne surrounded by the twelve apostles, what you see here is her death, also known as ’the sleep of Mary’ or the ‘dormition of Mary’. As legend has it, the apostles miraculously flocked together from all corners of the earth in answer to Mary’s prayer, to be next to her in her hour of dying. The funerary ceremony is led by Peter, wearing a chasuble, miniature angels are swinging thuribles (incense burners on chains), and Christ Himself appears on the cloud to receive His mother’s soul, represented in the image of a young girl. The painter of this work, Holbein, apparently, took great care in painting the various patterns, materials and draperies: it is enough to look at Mary’s bedspread and the angel hovering on the right to see this. 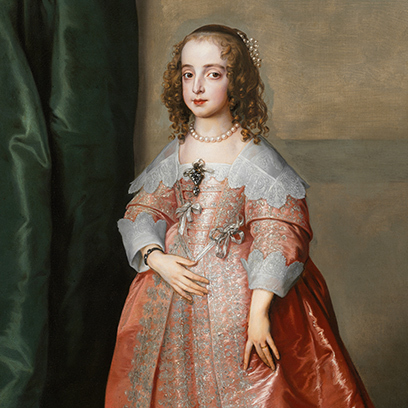 Note how he painted both the angel’s white dress and his colour gradient robe with spiral lines. One of the most important tasks of angels is to praise God. They do this in many ways: by singing, playing music, dancing or praying. 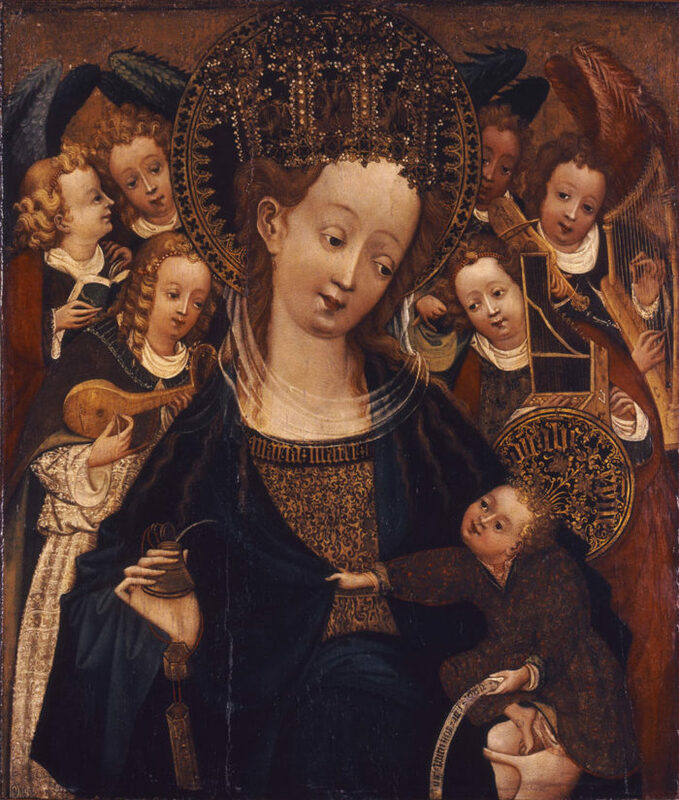 Angels often gather around the throne of Mary and Christ, like in this picture; if it weren’t for their wings, you might think that they were young altar boys playing music. 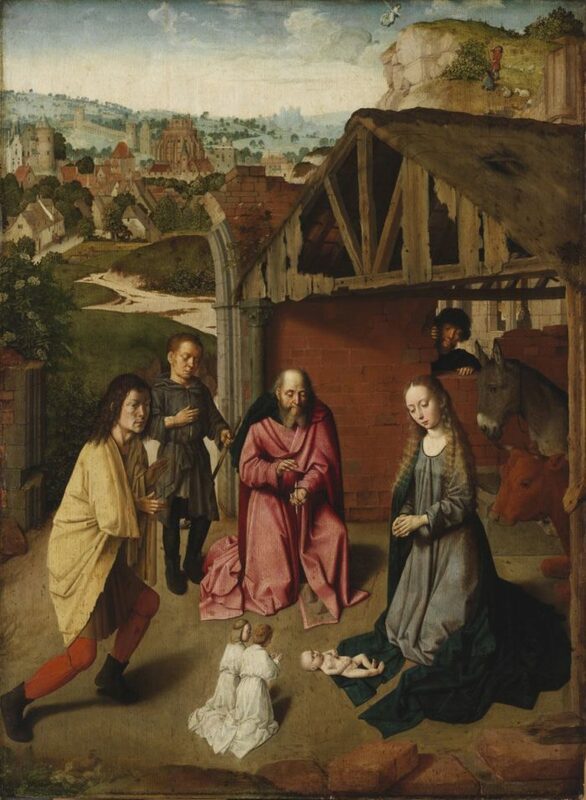 The Christ Child appears here as a naughty little boy, who will not stop pulling on his mother’s clothes until he gets hold of the ink pot he set his eyes on. 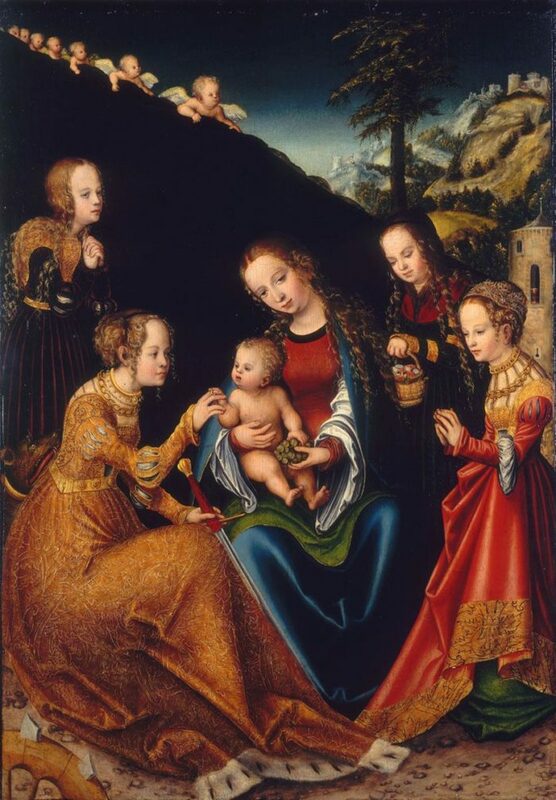 At times angels are not engaged in anything special; they are simply present at important events; for example, in this picture by Cranach, where naked chubby cherubim (angel children) are watching the betrothal ceremony of Saint Catherine of Alexandria. But why are they holding a curtain? Cranach’s works typically have two kinds of backgrounds: impressive Alpine landscapes and neutral, black backdrops. In this composition, the artist cleverly combined and thus created a special effect: the gemstone brilliance of the colours is enhanced by the dark curtain held by the angels, while the Alpine landscape on the right amplifies the fairy-tale character of the scene. The most famous angelic mission was undoubtedly carried out by Archangel Gabriel, you can see an important scene here too. 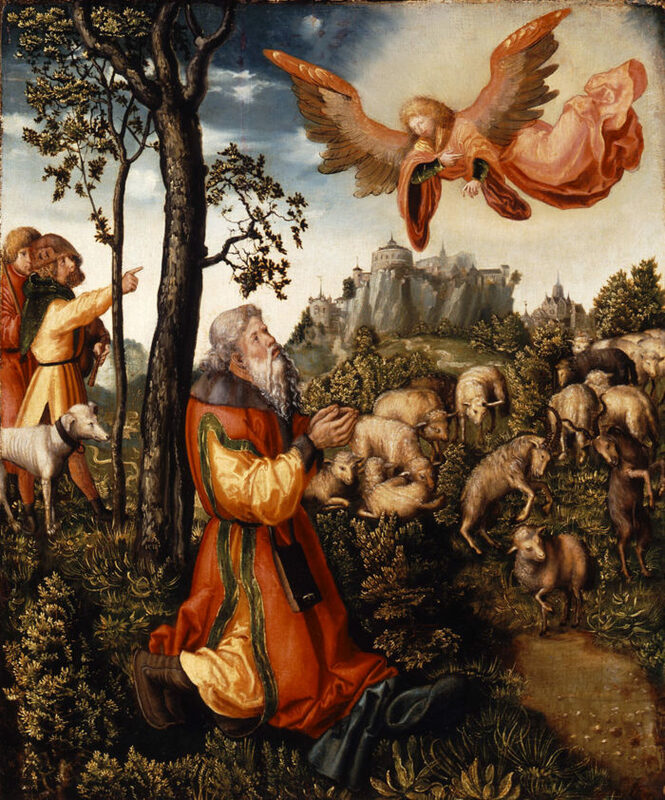 The picture shows Joachim, who felt such great shame for his childlessness that he fled to live among the shepherds. Not long after, an angel appeared to him, bringing the news that his wife, Anne, was soon to give birth to a baby girl, who should be called Mary and who, from the moment of her conception, would be filled with the Holy Ghost. 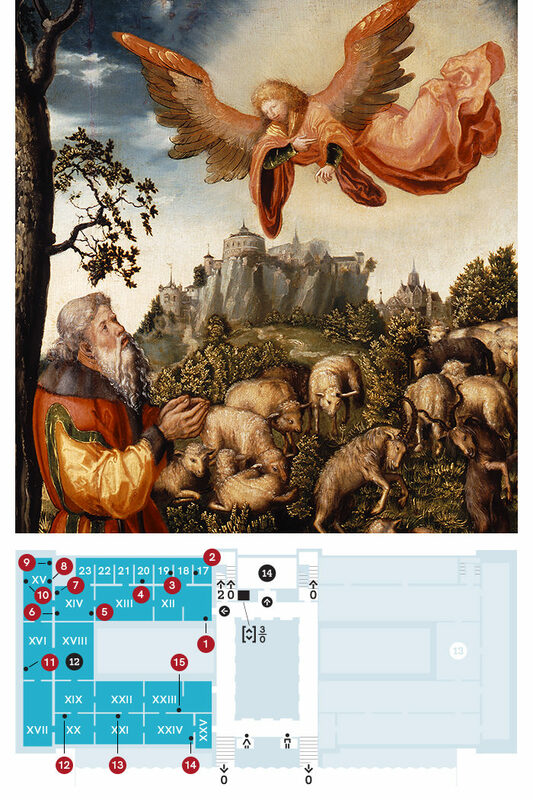 For Cranach it was important to show that the angel was not only seen by Joachim but also by the men standing on the left edge of the composition; one of them is even pointing in the angel’s direction. Cranach filled the landscape and the plants with masterly details; observe how he painted some of the sheep standing around peacefully and some engaged in a fight. Angels are for the most part beautiful but in some cases they can be surprisingly ugly. 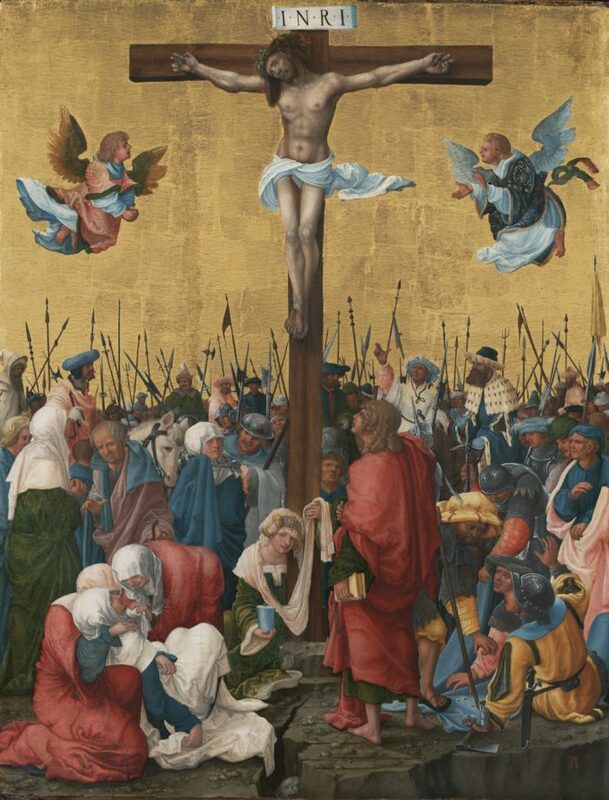 In this painting by Altdorfer, the angel hovering to the left of the cross bears a stark resemblance to Samwise Gamgee from The Lord of the Rings. Angels do not generally evoke associations with violence, if they need to stand up against evil, they will grab a sword and fight. The most famous angel in this respect is Michael, the prince of the angels, who defeated the dragon of the apocalypse. 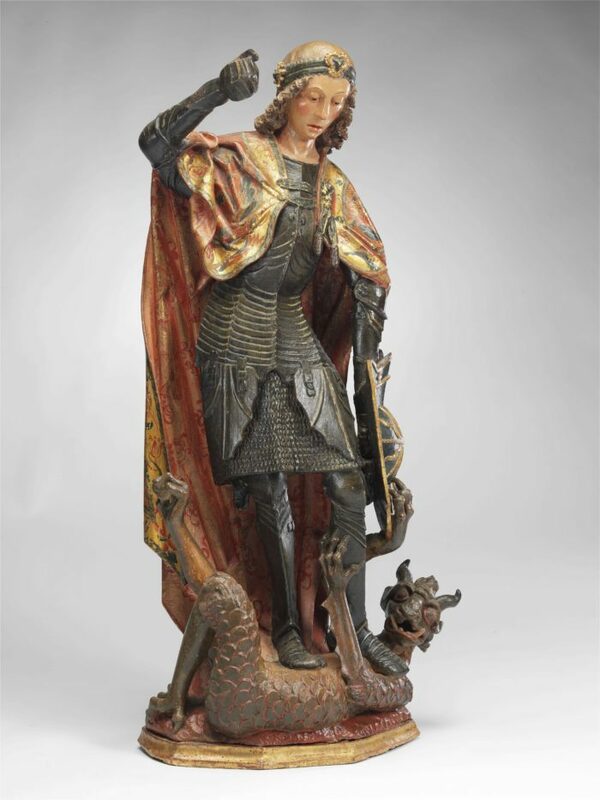 Archangel Michael is generally depicted with a shield and a breastplate, and sometimes – like in this sculpture – in full armour, which is why he can be easily mistaken for the knight Saint George, who is typically depicted slaying a dragon. 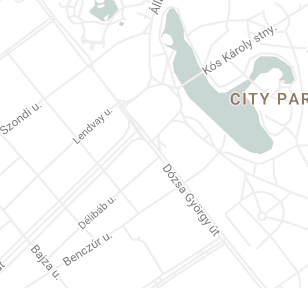 So how can you know that you see Saint Michael here? Looking at the back of the statue, the places of the wing endings can be clearly discerned, leaving no doubt that what you see is Saint Michael, ’prince of the heavenly host’. 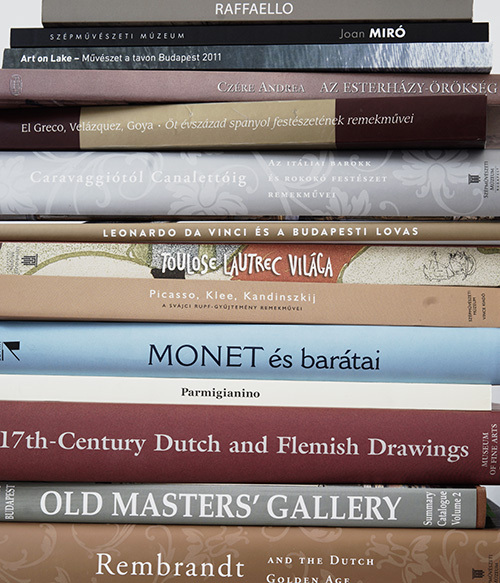 This work is the Museum of Fine Arts’ most recent acquisition. This painting by the Italian artist Marco d’Oggiono is one of the most beautiful angel depictions in our museum’s collection. The figure of his seemingly slightly cross-eyed angel with a kind face fills the entire canvas, blotting out the dark background almost completely. Although at first sight the picture feels static, looking at it closer you can notice that he is taking a step with his right leg, which is confirmed by the white ribbon across his left arm and the stark folds of the drapery. The angel is holding a thurible – a stemmed incense burner with a reticulated top and hanging on chains – in his right hand and a pyx (a carrier for the consecrated host, or Eucharist) in his left. Before continuing your tour, note the wings of soft feather and the sandals with black ribbons. Just like humans, angels can feel joy and pain. They are sorrowful when sad events happen: they can cry and wail; they have tears. The most tragic event of the Bible is obviously the death of Christ, so you are certain to find sad angels in depictions of this theme. 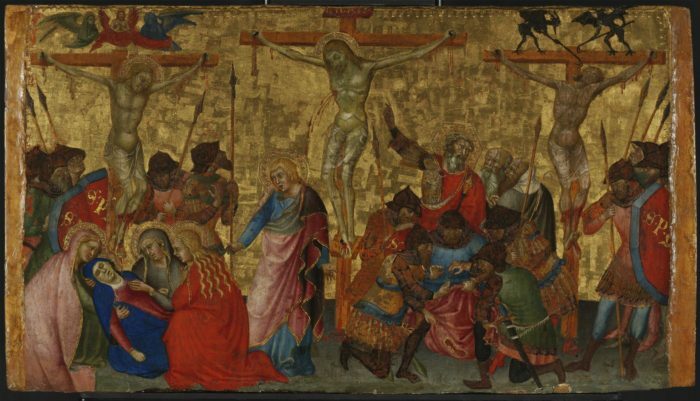 They are present at the crucifixion, the lamentation and the entombment. Angels holding the body of the dead Christ is a separate iconographic type. 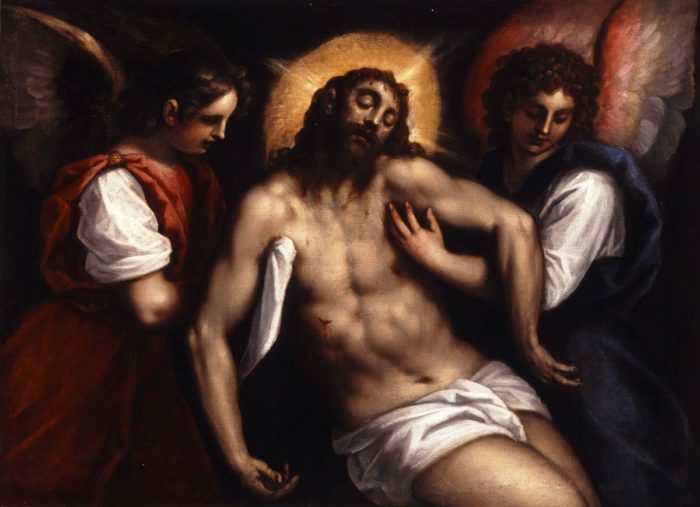 An example is this picture by Palma il Giovane, who uses subdued colours to paint this painful scene. The two angels are holding the softly contoured body of Christ with utmost care, barely touching it. The angel dressed in blue has soft, colour gradient wings, which are among the most beautiful angelic wings in the museum’s collection. After the Last Supper, Christ and the apostles went to the Garden of Gethsemane and then, leaving them behind, Christ retreated to the Mount of Olives to pray. It says in the Gospel of Luke that Christ was beset by a fear of death, and sweating blood, but an angel arrived to ’strengthen’ Him. In pictures depicting Christ on the Mount of Olives, the cup, which Christ must drink, is the symbol of God’s wrath and judgement, (“Father, if you are willing, please take this cup of suffering away from me. Yet I want your will to be done, not mine.”) but it also symbolises God’s mercy. 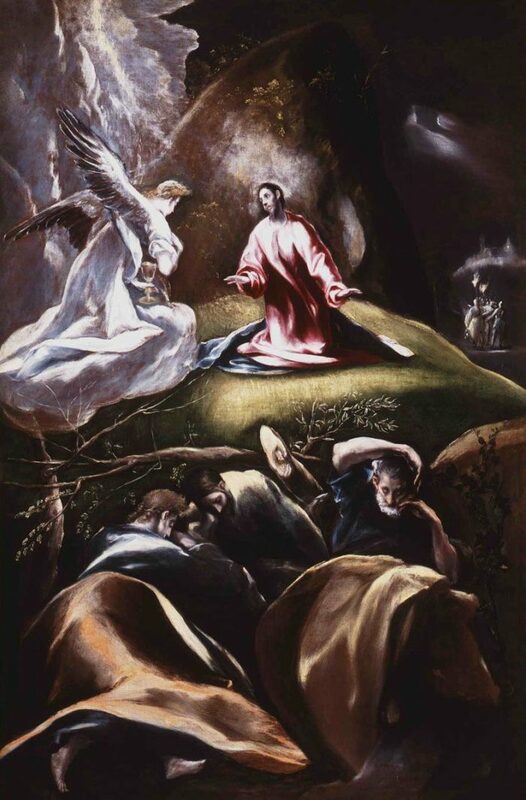 This duality is rendered in El Greco’s painting, where the angel bathed in light and holding a cup in his left hand is contrasted against the backdrop of an almost completely dark background. Although the painting does not show it, we know that this cup was sent by God, and although it is filled with bitterness and pain, it also contains the hope of resurrection, as suggested by the light. Are all winged beings angels? Not all of them. It always depends on the theme. In Greek mythology, for example, there are several winged beings: the god of love, Eros (Amor, to use his better known Latin name; Cupid) is typically depicted as a young boy with wings. 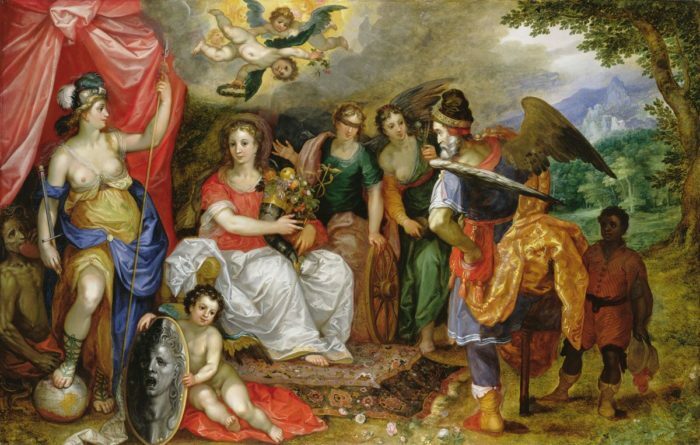 If you see a beautiful winged woman, it is most probably Nike, the goddess of victory. And who is this winged old man? He is Chronos, the god of time and the father of Zeus.